Why I Struggle to Enjoy Making Fun of "The Room"
I’ve never loved the idea of gleefully watching a movie that’s “so bad that it’s good.” Life is short and watching bad movies always felt more like a waste of time for me. For many, a bad movie is the opposite: it is something to be consumed with the same voracity and enthusiasm as a great movie. No other film summarizes this mentality better than “The Room” directed by the enigmatic and just plain weird Tommy Wiseau. “The Room” is a cultural phenomenon. It’s earned its place in history. The film is a failure on every conceivable level. But those who made it, the making of it, and the cultural footprint “The Room” has left have given it a life far beyond what Wiseau ever imagined. As a movie though, the way to watch it is wholly unique. The key takeaway I’ve gained from reading and hearing endlessly about the film is that you have to watch it with people. It’s a social experience. Why are we watching it together? Because like any good comedy, laughter is infectious, and being around other people in awe of this cinematic trainwreck is a genuine social experience. But unlike watching say “Sharknado” or “Batman & Robin,” the target of snarky one-liners and jokes is more specific. The target isn’t the film so much as it is the auteur behind it. And that’s where, for me at least, it goes from good fun to…being cruel? Let’s be clear. “The Room” is an abjectly bad film, through and through. But, for all his flaws, this is also a deeply personal project for Wiseau. And, give the man credit, he chased his dreams and produced a tangible product as a result. That’s more than many of us can say. And, on top of that, despite it being in a backwards manner, he’s provided hours of laughter and entertainment to the masses. And yet, at the end of it all, it feels like there is only one way that we reward him: by making fun of him. 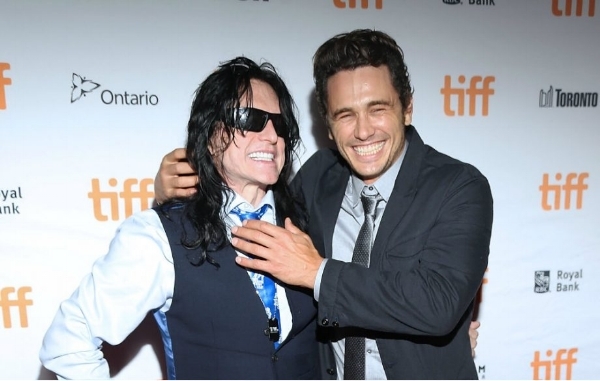 The history of the film is so iconic and fascinating that it inspired his co-star Greg Sestero to detail its making in the book “The Disaster Artist,” which went on to become a James Franco starring and directed film of the same name. The film scored rave reviews and has just taken home gold at the Golden Globes. Once again though, something about this movie just felt…off. Wiseau, to his credit, seems to be handling the career trajectory of his fame with more grace and good humor than I ever would. The embarrassment would kill me, even if in public I pretended to put a good face on things. At the end of the day though, I ask myself why we’re still having our fun making fun of “The Room.” Surely the joke is old by now. Are we doing this in good humor? It never felt like we’re laughing with Wiseau as much as we were at him. How about a year from now when “The Disaster Artist” is on Amazon Prime, will the joke still be funny? Was a lack of understanding about “The Room” why we made fun of it so much? And if so, does “The Disaster Artist’s” existence kill the joke? As I said before, I never knew where exactly the line in openly enjoying “The Room” in an ironic way was. Were we making fun of the movie or of its creator? And why is the joke still funny over a decade later?